When I decided to do it, I decided to do it by myself! Yes, no friends with me! I did not know anyone here in the States either – all my family is back in Poland. I found a job by myself (with a little help of a friend who used to live here long time ago). Most of the students go to big cities, like Chicago, New York, Boston…I lived in Warsaw, so I really wanted to get away from a big city in the summer time. To this day, everyone still ask me: “How did you end up in North Conway, New Hampshire?” Well, I love this place: lakes, mountains, fresh air and the ocean not far away! What else can I ask for? I was really excited…until the last day before my flight…Then all the sudden I got scared. I started thinking that this is crazy! I do not know anyone and I will be traveling so far away by myself. Well, there was no going back in time though. I spent too much money (probably close to $2000.00) organizing everything! Flight was smooth and I met some great people on the plane. Landed in New York City… Yes, New York City! The “student organization” I went through in Poland got us tickets to NY City, so we can go to “student orientation” and from there all travel to our final destination…It really didn’t make sense…so I skipped the orientation. I did not have much money with me, so the cheapest option was to take a bus from New York to Boston and then from there to North Conway. Once I got to Boston, I learned that the only bus that goes my way is at 5pm….and that I just missed it! Exhausted, hungry…now I had to figure out where to stay for the night and what to do for the next 24 hours! So I got a hotel room and it was money well spent. I was able to shower, change and rest. Next morning I decided to explore Boston a little bit, since I had the whole day till 5pm. Walking on the streets I was very excited and I was soaking everything in…!So different then back home in Poland. It was a beautiful sunny day (end of June), people on the streets were smiling and saying hallo! Yes, it was something new – nobody in Poland says “hello, how are you” to a stranger on the street! Such a little thing, but can make your day! 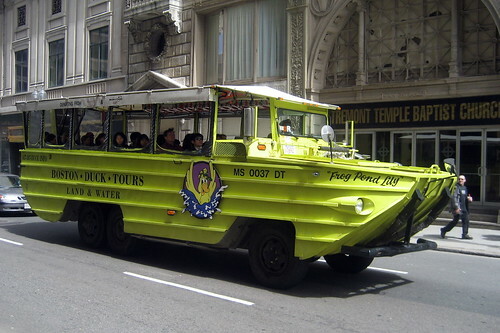 I spent couple hours at the Museum of science, got a lunch, walk around and found Duck tour! Yes, a lot of people think it is cheesy, but I really liked it. I didn’t have to walk! I learned some stuff about Boston and enjoyed this beautiful day in the fresh air. Most of you probably know that after driving around, boat eventually gets in the water. This is when the driver asked if there is anyone who would like to drive the boat? Few kids raised their hands and they were all able to have their turn. When they run out of volunteers, I thought: “what the hell, why not?”. The driver asked me where I was from and what was I doing in Boston. I said I was from Poland and I was here for 3 month vacation by myself! People couldn’t believe! I got my “boat drivers license” and went back to my seat. All people started talking to me and they were super nice! After the tour I started walking on the streets of Boston again and few minutes later saw the same boat with the same tour guide! He shouted:”Look everyone! This is Kasia from Poland!She is here by herself – it is her 3 month long vacation” Everyone started clapping and waving. It was really nice – probably would not happen in Poland. My bus left at 5pm and by the late evening I arrived in beautiful North Conway! I stayed here for the whole summer working and having fun, then travelled for about 3 weeks. It was a wonderful summer! I came back couple more times for the summers to exactly the same spot and eventually moved here after finishing college in Poland! Do I love it here? Yes, I do! Do I miss Poland? Yes, I do! But life is life, you got to do what you got to do. I do what makes me happy! Welcome to America. I love your posts; especially about Poland where my Mom’s came to America from. Please post more about the Polish language and thanks for the great post on the language.